Notice that one of the postcards looks like it's nearly falling out. My fault. I slipped them in before hanging this and didn't adjust it before taking the photo. 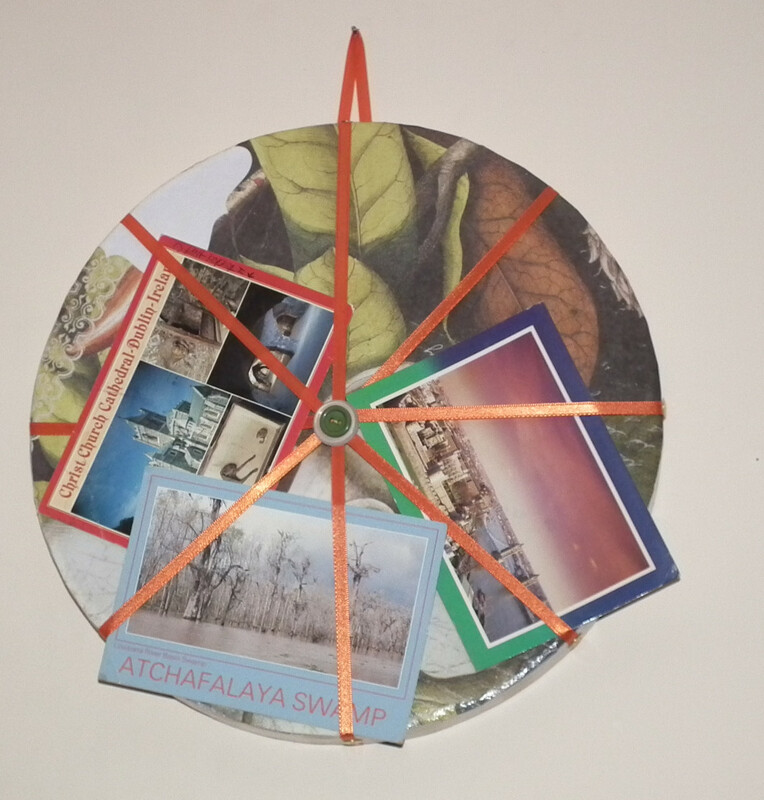 Start by getting your disk decorated. Outline the disk on the back of 2 sheets of the paper. Then cut out the circles just inside your lines. Cut 4 one inch strips from the other sheet and set the remainder aside for other projects. Coat one side of the disk with ModPodge and let dry until tacky. This will help create a better surface for applying the paper. Then paint the disk with Mod Podge and put the paper on it, smooth it carefully with a dry sponge as you apply it. Let it dry a few minutes, then cover the paper with a smooth coat of Mod Podge, going slightly over the edges to the side of the disk. Let that dry, and repeat on the other side. 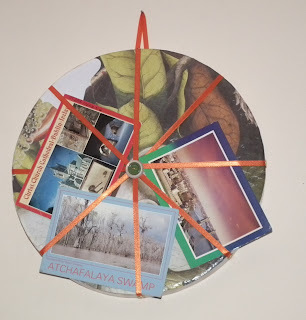 Then paint the edges of the disk with Mod Podge, let it dry until tacky, then put on more and working in sections, wrap the strips around the edge. Cover the edges with Mod Podge. Let dry. You may discover you like the look of one side better than the other, that one side just turned out a bit smoother or more evenly cut. That's your front. After it's all dry, it's time to start putting on the ribbons. Cut 4 pieces of ribbon 18 inches long. Wrap them around the disk pinning lightly. Then slide a pin through all 4 layers where they intersect in the middle. Unpin the outer edges and carefully lift the spoked ribbon shape off the disk. With your needle and thread and buttons, sew through all 4 layers to join them with the button (or stacked buttons. I love stacked buttons!). Sew securely. Put the ribbons on the disk. Because of the nature of the foam,I found using 2 tacks for each ribbon end was the most secure. I tacked them on the back, then again on the edges. The last 6 inch piece of the ribbon was folded in half, and tacked to the back of the disk to make a hanger. So easy!! And those postcards are out of the box they've been stored in and on display.